The cement work in most of ridge capping, and valley might be pretty hard and not need to be drag. This is known as roof re-pointing. No matter, you own cement roof or terracotta roof, the roof would need maintenance. The most regular roof repairs that take place are the roof re-pointing of ridge capping cement. Roof pointing is the second layer which moves over top of bedding to help in creating a stronger bond on the tiles and fix the roof against dirt and water. Despite the consequences, every roof requires attention to ridge capping at times and after the time comes there would usually be need for roof re-pointing. Roof pointing is necessary parts of a roof’s structure and needs standard maintenance to make sure your house remains in apex condition. Roof re-pointing is cement mortar that seize the roof tiles in place. In case, the re-pointing is not maintained, it might break or collapse completely and leave the roof tiles unsecured. The Unsecured roof tile might simply become dislocate, turning out to be dangerous for a person close to the house. Professional re-pointing services generally suggest doing a comprehensive re-pointing job. 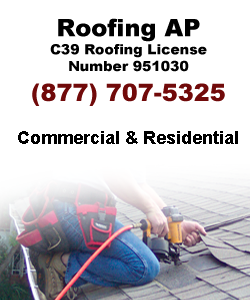 Get help of professional roofers at AP roofing for roof re-pointing in Los Angeles.